“We don’t know how many people it takes to encircle the White House, but we’re about to find out,” Bill McKibben told a crowd of over 12,000 gathered in Lafayette Square on Sunday afternoon. Such a prospect would have been hard to imagine eleven weeks earlier, when McKibben was standing in the same park with no more than a hundred people listening. It was the first day of what would become a two-week long campaign of mass civil disobedience targeting the planned construction of TransCanada’s 1,700-mile KeystoneXL oil pipeline from the tar sands of Northern Alberta to the refineries of the Texas Gulf Coast. What no one could have expected on that day in August was the explosion of mass sustained protest that would soon follow in this country. 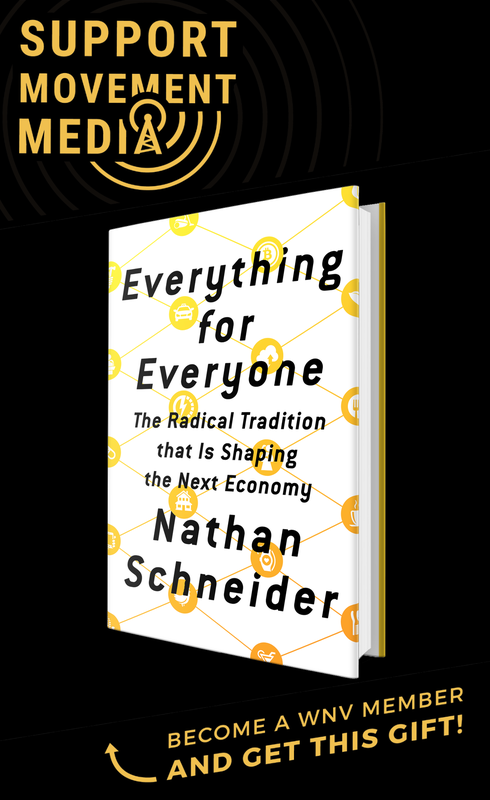 Occupy Wall Street was only in the planning stages at that point, but its emergence weeks later helped foster the sense that change is only going to come through dedication and relentless pressure. In the two months since the last tar sands protester was arrested, a series of calamitous events has befallen the pipeline and what seemed like a rubber-stamped process leading up to its construction. First a scandal emerged, detailing a cozy relationship between TransCanada and the State Department, the US Agency tasked with determining whether the pipeline is in the “national interest.” Uncovered emails show that the State Department allowed TransCanada to play a major role in choosing the firm that conducted the pipeline’s environmental impact study. Then, last week, it was revealed that the State Department lost tens of thousands of public comments on the pipeline and wouldn’t say how the remaining will be handled. And finally, just days ago, the Washington Post did a little digging into the industry’s reports on job creation only to discover that the numbers are based on fabrication and fuzzy math. There’s little doubt these trip-ups would have occurred—let alone surfaced—if not for the continued pressure of the tar sands organizers and protesters. Over the course of those two months, they protested at Obama campaign events, gained the support of the Dalai Lama, Desmond Tutu and seven other Nobel Peace Laureates, and found allies in Congress and the Senate. Even celebrities like Robert Redford and Marc Ruffalo took up their cause. Unfortunately, as rumor had it, the president was out golfing, perhaps to return home later in the day. 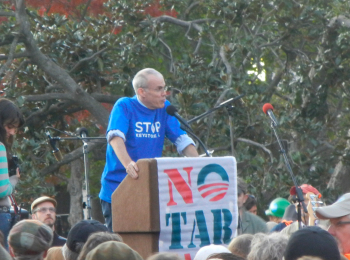 In the meantime, McKibben dispatched a third of the crowd toward the south side of the White House. 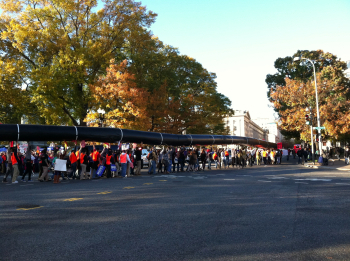 Throngs of people, young and old, paraded behind a snaking DIY-KeystoneXL pipeline that was hundreds of feet long. There were chants—such as “leave the tar sands in the soil, we don’t want your dirt oil”—and group sing-a longs. Most popular was a rendition of “Stand By Me” directed at Obama. The stunt was over after an hour and everyone returned to the rally staging ground in Lafayette Square for series of concluding speeches. The general mood was uplifting, almost party-like. And while the celebration may have been warranted, there wasn’t a single speaker who didn’t hint at the prospect of challenges to come. McKibben was suddenly interrupted by a whisper in his ear. “There goes the president’s motorcade,” he said, pointing toward H Street. The crowd immediately followed in unison: “Yes we can. 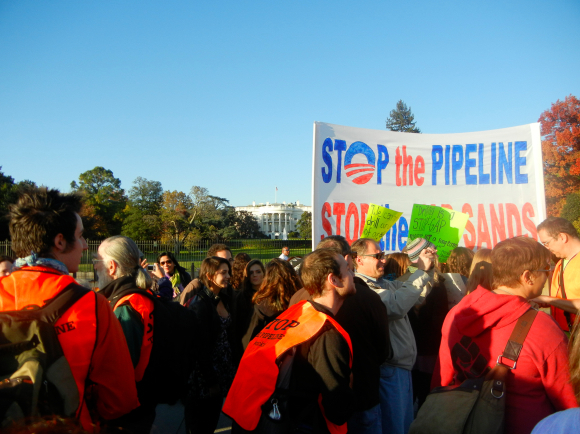 Stop the pipeline.” McKibben settled them down, saying, “Alright, he’s heard us. We’ve given him his chance.” Then he returned to the story. That day in the jail, the main thing I was worried about was that maybe they were right… I was only able to get out one little scrawled message, and I knew that people were worried about us in jail and the note just said, ‘We don’t need sympathy, we need company.’ The next day people showed up to get arrested and the next day and then all over the country and now this unbelievable crowd here today… We are in the middle of this game now. We are in this fight so deep and so hard that if we’re going to win it, we need you to go home today and fight like hell… This is the definition of a grassroots, wildflower movement. Nobody knew, nobody in that building [the White House] paid the slightest attention to the Keystone pipeline until August and now it is the biggest environmental and political flashpoint that they have to deal with and if we do our jobs, all of us right, then they are going to have to deal with it in the deepest way and that’s what we need. Damn it, we are going to win this thing if we do it right! Only time will tell, of course, and that time is fast drawing close, with a decision that must be rendered by the president before the end of the year. There have been hints that the period may be extended, but the longer it takes, the more money it’s costing TransCanada. More importantly, though, the longer it takes, the more it plays into the newfound strength of protesters in this country. 12,000 PEOPLE? WOW! THAT’S INCREDIBLE!